Have a question about the Oceanways Caribbean 2 Window Mask Wave Guard Snorkel Set? The newest mask in the Oceanways line is perfect for medium to small faces and comes in refreshing colors for a great price. Low volume 2-lens configuration with an easily adjustable buckle and high grade silicone skirt. Matched with the MaxDry Wave Guard Flex Snorkel with Barrel Drain. 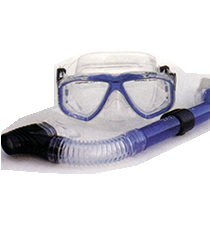 A great stylish choice for any Snorkeler or Diver.